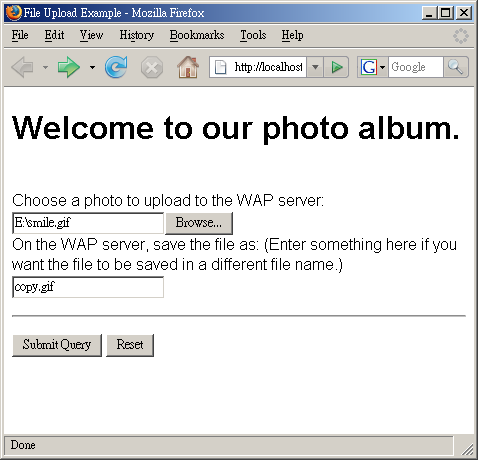 Below shows a PHP file upload script that is written to handle the form data submitted from the earlier XHTML MP document. The PHP script prints out the information obtained from the HTTP request and saves the uploaded file to the "/file_uploads" directory of the WAP server. The above PHP script is very straightforward. Most of the code has been covered before. Below shows some lines of code that you may be unfamiliar with. is used to set the MIME type of the PHP document. "application/vnd.wap.xhtml+xml" is the MIME type of XHTML MP. then a parse error will occur. is necessary in the example PHP script since some browsers provide the full path of the uploaded file in the HTTP request, which means $_FILES['myFile']['name'] may contain a path but not a file name. Hence, we need to use the PHP function basename() to extract the file name from the path. For example, both basename('/files/myFile.txt') and basename('myFile.txt') returns the string "myFile.txt".